TALLADEGA, Ala. – All four Stewart-Haas Racing cars were amply endowed with speed for Saturday’s knockout qualifying session at Talladega Superspeedway. Kurt Busch was just glad he got the pick of the litter. “Four Stewart-Haas Fords — I’m really happy that I got the fast one,” Busch quipped after winning the pole for Sunday’s 1000Bulbs.com 500 (2 p.m. ET on NBC, MRN and SiriusXM NASCAR Radio) and leading an SHR sweep of the top four starting spots for the second race in the Monster Energy NASCAR Cup Series Playoffs’ Round of 12. 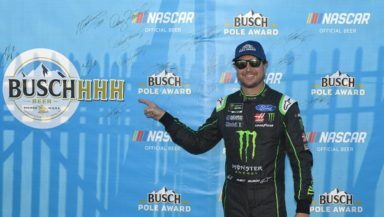 The Busch Pole Award was Busch’s fifth of the season and the 27th of his career. What’s more, his final-round lap at 195.804 mph (48.906 seconds) ended a quest dating to his first race in the Cup series in 2000. Busch beat teammate Clint Bowyer (195.301 mph) for the top starting spot by .126 seconds, a huge margin relative to the rest of the top 12. Kevin Harvick (195.186 mph) qualified third, followed by Aric Almirola (194.571 mph). The time trials, however, were a tale of two organizations, not just one. Behind the four SHR entries were all four Hendrick Motorsports drivers, with last week’s Dover winner, Chase Elliott, leading the way into the fifth starting position. Jimmie Johnson, Alex Bowman and William Byron were close behind. “With all four guys in the top 12, it’s a strong showing for us,” said Byron, whose lap time of 49.420 seconds (193.768 mph) was identical to Bowman’s. “That should be good for Sunday. Qualifying doesn’t reflect totally on how things will shake out Sunday and how you are going to race. But it should be fine. All four SHR drivers are competing for the series championship. Elliott and Bowman are still title contenders for Hendrick. Playoff driver Kyle Busch qualified ninth in the fastest Toyota, with reigning series champion Martin Truex Jr. claiming the 11th starting position. “You always want to make the second round, and you hope you can do a little better,” said Truex, who has never won a restrictor-plate race. “We thought we picked up some speed, and we gained one spot, beat the 17 (12th place qualifier Ricky Stenhouse Jr.). The remaining four playoff drivers qualified as follows: Brad Keselowski 18th, Ryan Blaney 19th, Joey Logano 20th and Kyle Larson 34th. With the playoff field set to be cut from 12 drivers to eight on Oct. 21 at Kansas Speedway, Bowyer and Almirola currently are tied for ninth in the standings, 10 points below the cut line.